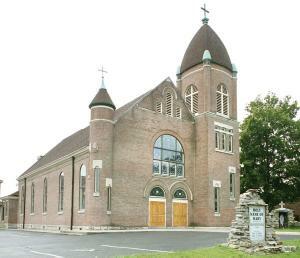 Sundays — Sat evening: 4:30 p.m.; Sun: 10 a.m.
Daily — Mon-Thu: 8 a.m.
Holy Name of Mary was described as “a community of living faith for the last 200 years,” when the parish celebrated the centennial of its third and current church, built in 1891. The pioneer settlement of Rolling Fork, or Buckman’s Station, attracted Catholics from Maryland, including the Spalding and Abell families. Both families exercised historic leadership in the infant Commonwealth and the missionary American Catholic Church. An Irish Franciscan missionary to Calvary was followed by Fathers William DeRohan, Stephen Badin, Michael Fournier, and Charles Nerinckx, who resided here but rode the Kentucky mission circuit. Father Fournier was the first pastor of this parish. In 1805, Father Nerinckx laid the cornerstone of a log church titled Holy Mary (later Holy Name of Mary). A small brick building succeeded it in 1830. Devotion to the passion of Christ among these Calvary residents inspired the installation of painted Stations of the Cross in the third church. The parish was an educational center as early as 1816, when the Sisters of Loretto established Calvary Academy, educating young women until 1900. The Ursuline Sisters of Mount St. Joseph came in 1920 to teach elementary and high school students. Father Thomas Otho Durbin built this second school, which later became a retreat house and then a parish center. The third church was constructed in 1920 and paid for by 1924. Meanwhile, parish life continues to evolve among the descendants of the pioneer settlers and more recent parishioners. Early in the new millennium, a renovation of the church interior took place. In recent years, further restoration took place, and an outdoor grotto to Our Lady of Lourdes was built, incorporating stones from the foundations of historic buildings. The parish was dedicated to Saint Isidore the Farmer. A new parish hall was constructed in 2005. Today, the nearly 900 parishioners of Holy Name of Mary have expanded their vision of the Church and world in need of faith, resources, and participation.